We were kids again on our last full day in New York city and went to the American Museum of Natural History. It started, well, at the beginning with the Origins of Man. We saw "Lucy," the skeleton that may have once belonged to everyone's mother. We also saw Neanderthals and other human-types and were amazed to realize how recent we were as homo sapiens. From there we went to the gems, minerals and meteorite displays and I ogled the stones and soaked up the beautiful jewelry on display. Trying to keep in mind, of course, the Buddhist perspective on craving and desire ... no use!! We saw the great whale and the tiny krill and other wildlife installations. Many of the exhibits represent a different era, and consist of real skins and "captured" animals ... I tried to remember that we know better now than to kill animals for public display in museums, but it was a little tough. 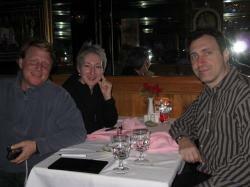 Friday night, we at last had our much-awaited Indian dinner at the Taj Mahal with our friend, David. We stayed until long after the restaurant's closing and they were gracious enough to allow us to sit while they closed for the night. Our train was to leave Saturday at 3:15 p.m., so the next day was a short one. We ventured by subway to the Village, had coffee and walked past New York University. Just before leaving, we found a small shop with Tibetan crafted items -- pashimi, scarves, amulets, Buddhas. I purchased a Tibetan coin that now sits with other treasured totems on my office bookcase. We got on the subway, went back to the hotel, picked up our bags. A short cab ride later, we're sitting in Penn Station, waiting for our train home.